﻿ Using Stones for Personal Growth. Black Tourmaline: Kindness. 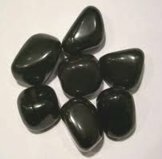 Black tourmaline is an opaque, black, common crystal that can form in either short or long columns with longitudinal striation parallel to the main axis. It also goes by the name Schorl, and is black because of its iron and magnesium content. Tourmalines are mined in the U.S., Russia, Sri Lanka, and Brazil, and are usually easy to identify because of their striation. Tourmalines have been used by shamen among the African, Native American, and Aboriginal tribes. This stone is special to Native Americans, who have used it as a protective stone against negative spells. Black tourmaline acts on the Inner Being to strengthen Kindness. Kindness is a generosity of spirit that makes you willing and ready to offer the use of your energy to benefit another person. It is part of being able to love by giving in an unselfish way. Kindness is making yourself aware of the needs of others, so you can offer to give them what they need, sometimes even before they ask. Kindness is what lets you help someone across the street, even though you don't know him. Kindness has both a doing side and a knowing side. The doing side is a ready willingness to give of your energy just to be good to someone, or to yourself. The knowing side is recognizing what sorts of things are kind to do, and comes from being aware of what is helpful and desired by the person you wish to be kind to. These two aspects of kindness work together as two sides of the same duality. This means that as you develop your awareness of what is kind, you also become more willing to use your energy to benefit others. Whenever you are kind to someone, it means you care for that person enough to give him part of your energy just because you think it will benefit him. But you can't do this for everyone because your energy is limited. So how much energy should you put out to help someone? As much as you want, because it can be very rewarding, but don't go beyond the point where giving of your energy starts to hurt you. Keep in mind that kindness also includes being kind to yourself. It is unwise and unkind to yourself to give if you hurt yourself by giving. Every person has the right, if not the obligation, to look after himself at least as well as he looks after others. This balance between looking after yourself and looking after others, is something that many good and unselfish people still need to learn. To enhance your capacity for kindness, consider changing your outlook in a couple of areas. Try learning to be a better friend by making yourself more available and accessible to someone you care about. Allow this person to know he can ask you when he needs something, that you are available to help look after him in whatever way he needs it. Let him know you will always respond to his desire for help. Don't force your help on him, but just let him know he can ask you when he needs something. Just knowing that someone is out there for him if he needs it, can give him a strong sense of well-being. By being your "brother's keeper", or at least supporter, your kindness contributes to making his existence more gentle. Another key to becoming a kinder person is to develop a concern for "the big picture", a concern that makes you want to help cure the ills of the world. Like an activist, develop a global concern for what the "world needs now". Become more aware of how the world operates, of world affairs, and of how life is for people in distant places. Realize that everything that happens in the world impacts your life in one way or another, and if things are not good for others, they are not really good for you either. Since we are all part of the same world family, what helps one helps all, and what hurts one hurts all. The ability to respond to the needs of the larger group is its own form of kindness. In addition, work at becoming more aware of the qualities you really appreciate in someone you care about. Think of the qualities you find most valuable in him, and respect him for possessing those qualities. Then practice being kind to him by showing him you appreciate him, and by acknowledging how special he is to you. Show your gratefulness for who he is by holding him in high regard or esteem, and by letting him know how valuable he is to you. Acknowledging a person's worth by respecting him is a form of kindness in itself. For example, you would respect a teacher if he were knowledgeable and able to get his point across. You would respect his ability to teach, and look up to him because of it, even though you might have no idea how he operates in other areas of his life.